I love daisies (as you might be able to tell by looking at this blog) and I love love making daisy cupcakes! 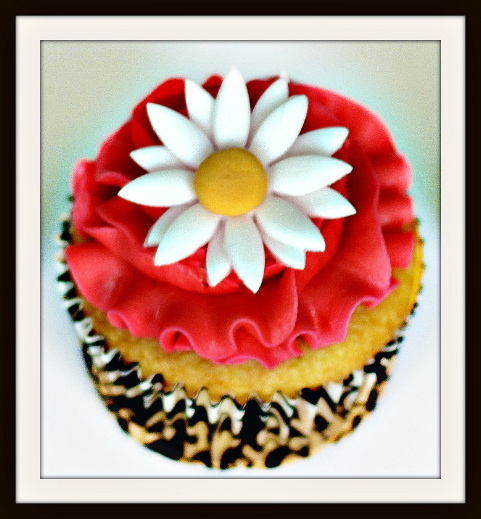 Here is a tutorial on how to make my signature daisy cupcake! You could make these for any occasion including bridal showers, a get well surprise, birthdays and even weddings! -The center yellow dot is yellow fondant that was rolled out into a ball then placed in the center. -You can stick the two layers of petals together with either frosting, piping gel, or almond extract. You can also stick the yellow center on the same way. -The curvy tray that the daisies are sitting on help them to dry in that shape so that they aren't laying flat. Let the daisies dry on it overnight or if the fondant is thin enough they could be ready within an hour! p.s. I'm so excited for June!! It's going to be wedding month here at the Little Delights In Life :) I have so much planned including wedding cake tutorials each Tuesday, guest posts (featuring their own wedding cakes plus some wedding stories), and so much more (maybe even a giveaway!)! Come back on Friday, June 1st when we kick off this extravaganza! Thank you! It's so true! So cute! Loved the bright color!